Ndamukong Suh is expected to be released by the Miami Dolphins this week with three years remaining on his $US114 million contract. The move is being made even though Suh is still one of the best defensive linemen in the NFL. There was no chance Suh would have ever seen the end of his contract based on how it was structured. 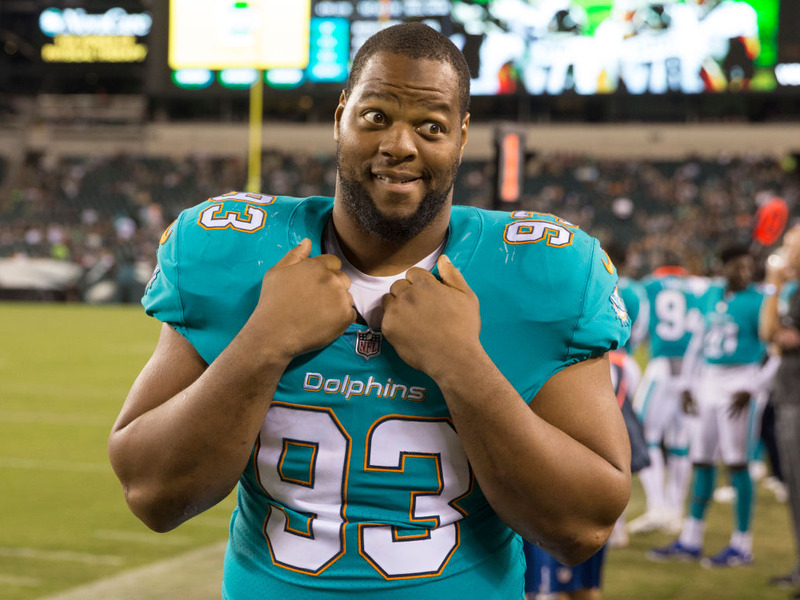 In the end, Suh received $US60 million in three seasons. Ndamukong Suh is expected to be cut this week by the Miami Dolphins, according to several reports, and it is just the latest example of how, unlike other sports, huge contracts in the NFL are mostly a sham. According to Jeff Darlington of ESPN, the Dolphins’ “plan” is to release Suh as early as Monday. Ian Rapoport of the NFL Network said the move will likely happen on Wednesday when the new league year starts and the team is able to spread the cap hit out over two seasons. Still, it is a curious move considering Suh is still one of the four best interior defensive linemen in the NFL, grading as “elite” with a Pro Football Focus grade of 91 in 2017. The bigger problem is likely just that Suh’s 6-year, $US114 million contract had become a nightmare, something that was expected when he signed the deal prior to the 2015 season. Based on how it was structured, there was little chance he would ever see the end of the deal. The big issue was how much Suh counted against the salary cap each season. To put those numbers in perspective, over the last three seasons, Joe Flacco had the highest salary cap figure in the NFL at $US24.6 million and no defensive player had a figure higher than $US22.1 million. In other words, right off the bat, that $US28.6 million salary cap figure in 2016 was never going to happen. Sure enough, the Dolphins did restructure the contract after the first season, giving Suh a $US20 million bonus. That lowered his cap hit in 2016, but raised the number in each of the four remaining seasons. Suh’s $US26.1 million cap hit for the 2018 season would have been the third largest in the NFL and one of only two among the top 14 that went to a non-quarterback. At this point, the Dolphins basically had two options: 1) restructure the contract again, with another big bonus up front and likely having to add two years to the deal to spread out the cap hits (Suh would have been 33 in the final year of the contract); or 2) release Suh. With none of the remaining years on Suh’s contract guaranteed – standard operating procedure in the NFL – the decision was probably an easy one, despite still being one of the best players in the NFL. In the end, Suh received $US60 million for his three seasons of work in Miami. Nobody is going to feel sorry for Suh, but that is still a far cry from the $US114 million that was announced in 2015. Suh recently spoke with Business Insider about how much athletes really get when they sign those enormous contracts. It turns out he will be getting even less and it is no surprise.